The cold season brings frequent cold-related ill health due to feet hypothermia. Today, this problem can be solved with such technical solution as heated insoles. All you need to do is to slot them inside shoes instead of regular insoles and enjoy a warm during all-time in the open air. This know-how is used for a long time in ski sports. The insoles are slotted inside ski boots and the rider enjoys a comfortable leisure. As for townsfolk, they had only recently taken into attention this convenient device that allows forgetting about cold feet, colds, and various chronic diseases. This is a relatively new development that can heat the insole’s surface up to +45ºC. It is noteworthy that funds for its serial production were collected through the crowdfunding platform Kickstarter. 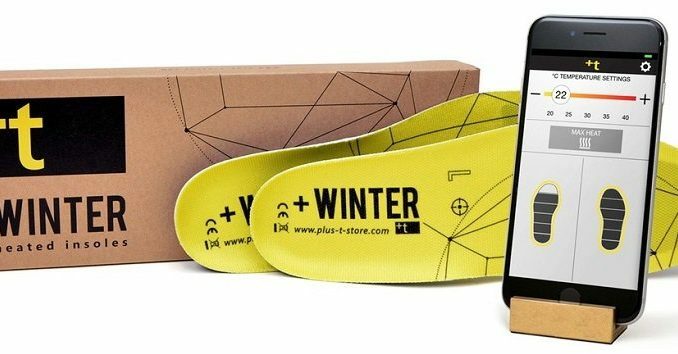 More precisely, these types of heated insoles have already been made, but developers made a decision to cover more market area thanks to additional investments via Kickstarter. They are splash proof, ensuring reliable work in all weather conditions. +Winter kit consists of two insoles and one charger and costs $97. However, this kit requires charging one insole after another only. So, a kit with two insoles and two charging devices is also available for $117. In fact, its price is currently very high. Besides, other manufacturers move forwardalso, and produce insoles with similar technologies, which are much cheaper more than one year. Below we are going toexamine a few examples. 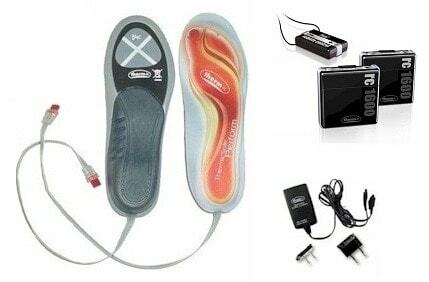 Insoles called Heat Generator are devicesthat allow heating the feet in the inability of using batteries or a battery pack for longer hiking, camping, fishing, etc. Two sizes – 22cm for shoes from 33 to 38 size, and 25cm for size 39-45. The price of the chemical shoe heater varies depending on the number of acquired pairs. If you buy 5-9 pairs it cost $3,17, 10-19 pairs will be sold for $2,25; 20-95 pairs cost $1,58 per pair. The insoles are designed for one-time use exclusively. Therm-ic Perform is a battery heater for foot beds, which has become an integral part of the ammunition ofwell-known skiing and snowboarding boot manufacturers, such as Atomic, Salomon, and Burton. To start heating the shoe insoles through Therm-ic Perform, it’s enough to slot them instead of conventional insoles and connected via a special cord to the battery. The system allows you to provide ongoing temperature support in the domestic climatic conditions from – 25°C during the whole day of skiing. You may mount the power supply unit either on the outer part of the shaft or on the belt. The only thing that restricts the position is the supply cord length. Therm-ic Perform insoles price is $22,5 dollars per pair. SIDAS are battery-powered insoles from the famous French manufacturer, who focused on sportsman-wearer comfort. This model with an electric heater is developed in the Podiatech Medical Research Center using orthopedic constructions and elements, providing the correct foot placement and efficient athlete’s musculoskeletal system functioning during training or competition. As soon as the SIDA Sinsoles thickness does not exceed the thickness of conventional shoe accessory, they can be easily used to produce heat with casual shoes. Moreover, the cost of the insoles is only $36,67 a pair. Thanks to the heated insoles people will not have difficulty in the cold season. While we do not to wary about any disasters and the negative consequences, as soon as the power of the electrical heater is absolutely safe for human life. As for chemical models, they do not have any harmful effects. So, slot them inside the shoes and forget about freezing feet at all temperatures and in all situations. The new business idea is to sell the product.